Self regulating heat trace cable. Self regulation heating cable in used in many industrial and commercial applications to maintain temperatures in pipes. vessels, and tanks. 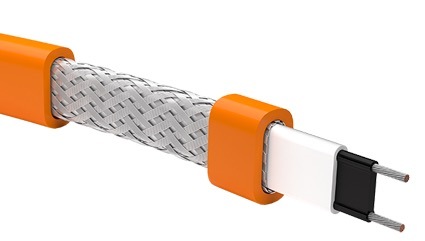 Whereas constant wattage cables produces the same power output irrespective of process temperature, self regulating cable automatically adjusts the power output depending on process temperature. For example, during a startup or when ambient conditions are cold, the fluid in the pipe may require more heating power to maintain the desired process temperature. In this situation, the self regulating cable will produce a higher wattage per foot to heat the pipe. As the process media temperature increases, then need for that amount of input power decreases, and the self regulating cable automatically cuts the power output accordingly. This video, courtesy of Raychem, provides a short but informative understanding of how self regulating heat tracing cable (sometimes referred to as "heat tape") works.